The STEM Transformation Institute positions Florida International University as a living laboratory for developing future STEM professionals, especially those from statistically underrepresented groups. The Institute is dedicated to advancing discipline-based education research, leveraging and implementing best practices; and informing policy that facilitates an increase in the number of competent and effective STEM professionals for the nation. The STEM Institute emphasizes core strategies for institutional and national wide impact include the Learning Assistant program, implementation of 14 state of the art Active Learning Classrooms, Mastery Math Programs, Modeling Instruction, FIUteach Program and cutting-edge Discipline Based Education Research (DBER). The STEM Transformation Institute has taken a decidedly multidisciplinary approach in its response to national calls for increasing the numbers of STEM teachers and professionals. The Institute is developing and implementing best instructional practices for STEM courses by drawing on the expertise of our university’s faculty and community partners in K-12 schools, colleges, industry, foundations and national education leaders. Our mission as a living laboratory for the future of STEM is to enculturate evidence-based instruction as the expectation for all courses on campus. 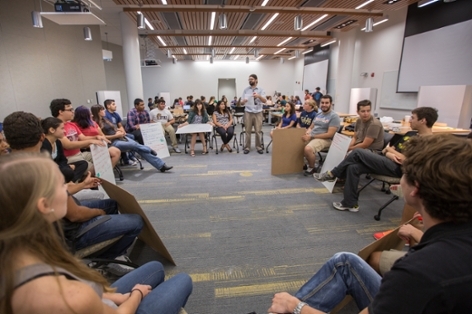 FIU has 14 state-of-the-art classrooms recently built and designed to house active learning at a financially sustainable scale. Currently, 100+ sections of STEM courses are taught in these classrooms serving more than 5000 students. All these classes require faculty to commit to active learning — putting down the textbooks and tackling scientific challenges with hands-on approaches. These classrooms represent one way the STEM Transformation Institute is committed to expanding the reach of our active learning goals while supporting the National Science Foundation, Howard Hughes Medical Institute and National Math and Science Initiative projects that are housed within the institute. The Learning Assistant program was pioneered at FIU through the FIU PhysTEC project. This project is a joint effort at improving teacher preparation facilitated by three of the most prominent national physics societies – the American Physical Society, American Institute of Physics and American Association of Physics Teachers. 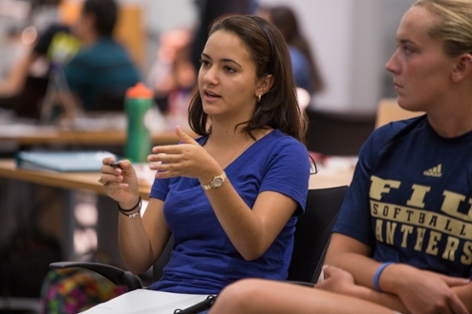 The Learning Assistant program includes mathematics, physics, biology, chemistry, psychology, earth and environmental science, engineering, computer science and philosophy departments and is integrated into FIU’s science and mathematics teacher preparation programs. Currently, FIU has the largest Learning Assistant program in the nation. Learning Assistants (LAs) are undergraduates from any major interested in teaching. The LA program is a recruitment path for teaching certification. Total of 322 Learning Assistants support 43 different courses and 146 sections (as of Spring 2018). 11,470 students are in LA-supported courses. LAs also provide support for FIU’s Mastery Math Lab, designed to improve college algebra pass rates. LAs are drivers of change through their engagement with faculty — must be active learning classroom to merit integration of LAs. Significant impact on production and retention of STEM professionals. The FIUteach program is part of the National Math and Science Institute’s UTeach program, a nationwide secondary STEM teacher preparation initiative which aims to place more than 9,000 new math and science teachers in classrooms across the country by 2020. The program enables STEM students to earn both a degree in their major and a teaching certification without adding time or expense to their four-year degree program. Research indicates that attitudinal shifts in introductory physics are nearly uniformly negative (i.e. students like physics less after taking a physics course). 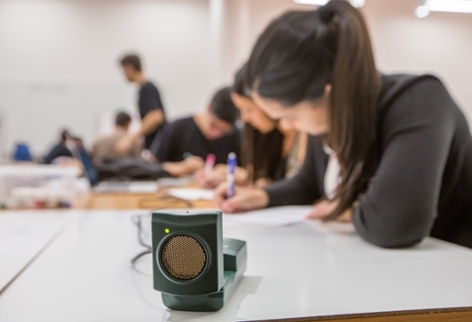 However, with the implementation of active learning and Modeling Instruction courses at FIU, data shows positive shifts across multiple instructors and multiple sections. One of the key factors for these results is that Modeling Instruction classes have shown to have conceptual learning gains twice as big as those found in traditional lecture instruction. This means that students are learning more and are enjoying learning more after a Modeling Instruction class. Also, Modeling Instruction classes have higher pass rates than traditional lecture instruction classes.